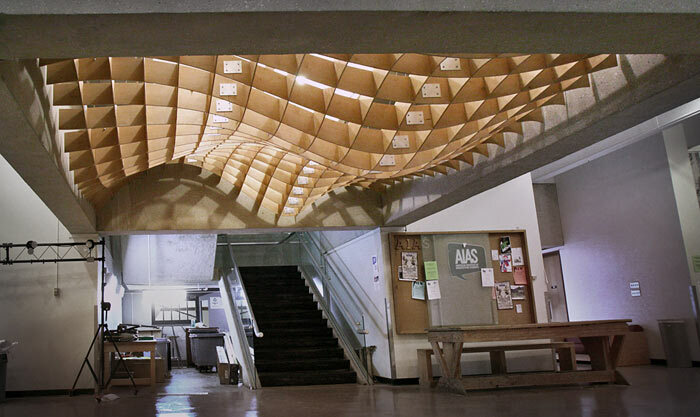 An student-designed and constructed architectural installation made of undulating slices of plywood has warmed the ambience at the bottom of the first-floor stairwell in the College of Architecture’s Langford A building. 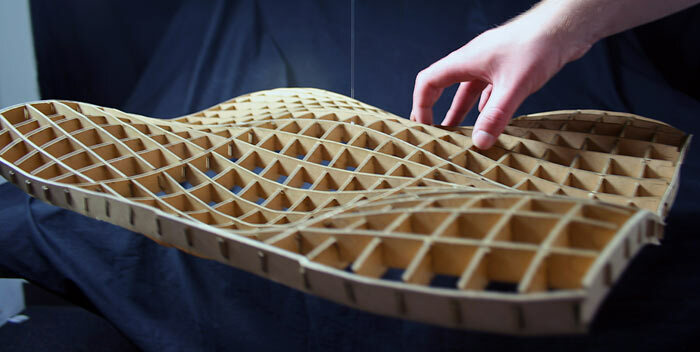 “Plywood Mesh #002,” a digital fabrication installed between beams on the first-floor ceiling, was the result of a spring 2009 Experimental Home Architecture studio led by Mark Clayton, professor of architecture at Texas A&M. 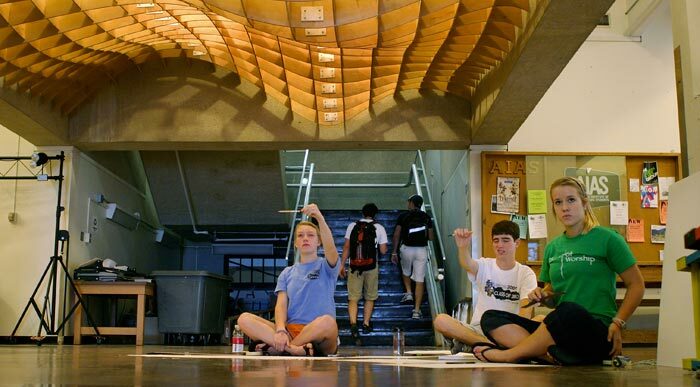 “It started as a small furniture project and evolved into an extended 18’ x 16’ sculpture,” said Josh Canez, who with environmental design classmates Nick Schaider and Lauren Hensley, designed the project, fabricated the pieces at the college’s Riverside Campus Digital Fabrication Facility and installed it in the Langford building. Canez and Hensley graduated in May 2009, and Schaider is graduating this December. 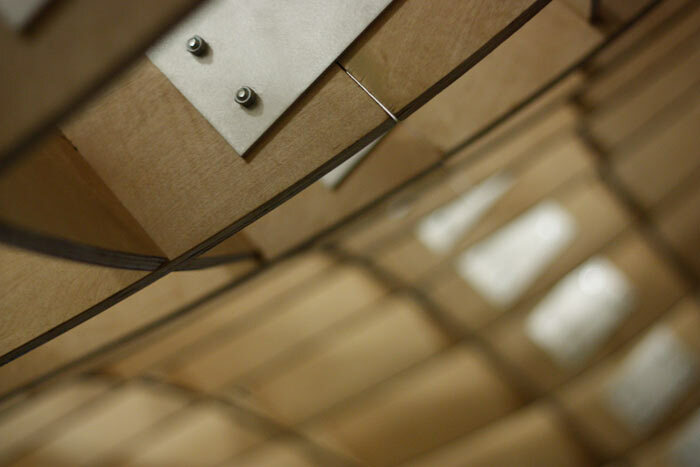 The piece, whose construction and installation was funded by Clayton, is a series of interlocked wooden shapes connected by notches and steel plates and hung from cables attached to the ceiling. The resulting form, wrote the students in their project proposal and installation plans, is a dynamic gridded mesh drop ceiling that redefines the location and creates a sense of place. Canez and Schaider where old hands at the fabrication facility where they had previously worked on the Aggie solar groHome project, the College of Architecture’s entry in the U.S. Department of Energy’s Solar Decathlon in 2007. 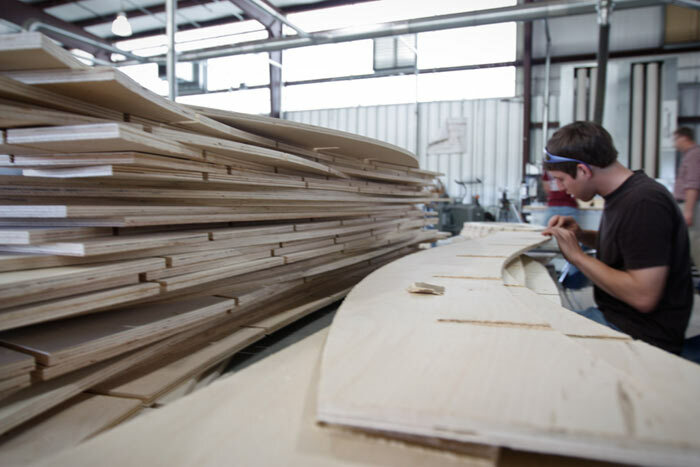 Once they cut the piece’s flowing segments out of 26 sheets of plywood using the facility’s CNC mill, it was quite a task to keep them all organized. Even though they team had developed a small prototype model of the design, they ran into some unexpected problems during the final assembly. It was not until the end of the project that the students began to completely realize the tangible results of their summer-long effort. 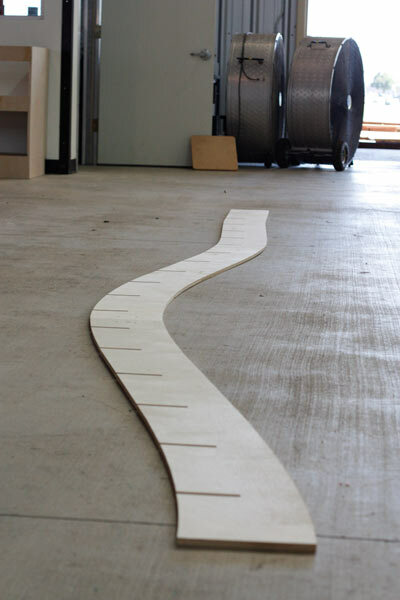 It took about 14 hours to install the 700-pound structure, which is composed of nine modules. 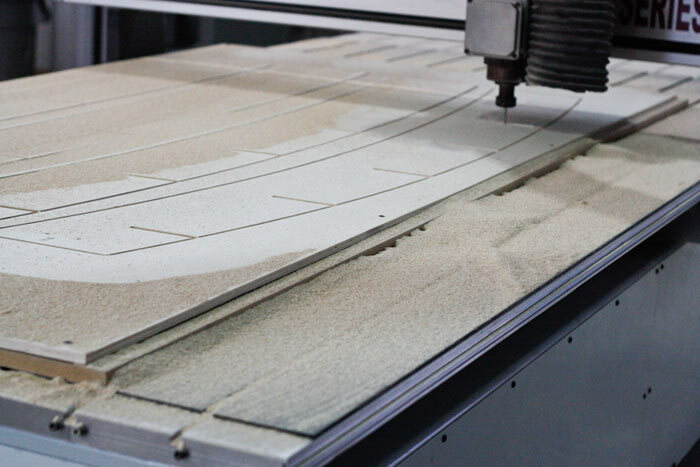 “We put three modules together in a line, squared the first one as best we could, brought the next two up next to it, and tied it in with aluminum plates,” said Canez. Throughout the design and construction phases, the students debated a variety of options for lighting the installation, said Schaider. But once it was installed, he said they were surprised to find the existing light worked perfectly. 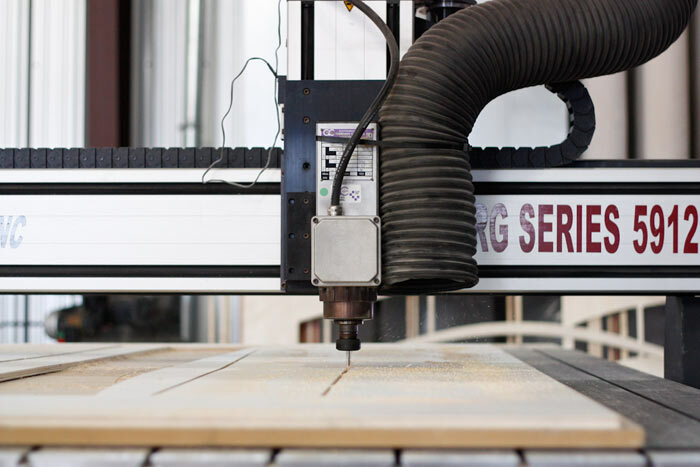 The team said they were extremely grateful for the support they received from instructor, Clayton, and the staff at the Digital Fabrication Center, Chuck Tedrick, digital fabrications manager, and Brawny Gary, his assistant. Hensley said the lessons she and her collaborators learned in the process transcended the design and construction curriculum. After completing the project, which stretched from last spring into the fall semester, the students are pursuing new goals. Hensley began her first year in the master of science in construction management program at Texas A&M. 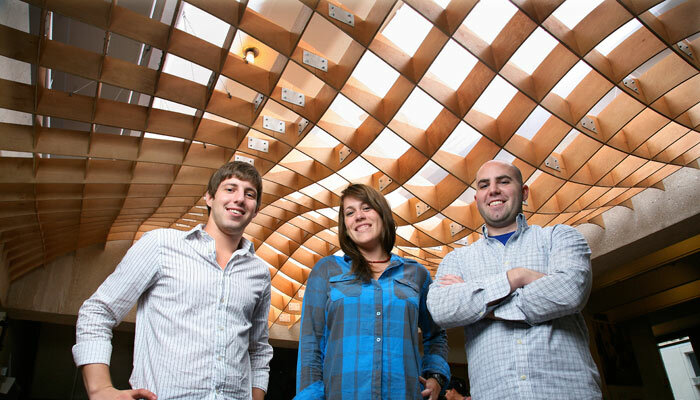 Canez is applying to graduate architecture schools while working for a modular construction firm that builds schools and houses, and Schaider will be job hunting when he graduates this fall, eying a position with a graphic design and marketing firm.